Be guided through the development of your own xAPI-enabled project at this 1.5 day, hands-on workshop. The Experience API (xAPI) allows activities to be tracked as learners perform them. Think of it as a stream of activities that a learner has performed. xAPI provides you with the opportunity to track course interactions at a granular level, measuring far beyond basic course completion. Using xAPI also allows you to track performance data outside the LMS, with the potential to integrate with other data streams to see how learning experiences affect a learner’s day-to-day activities. Get started with xAPI at this immersive, hands-on workshop. Industry experts will guide you through the process of getting started with xAPI while building your functional knowledge for immediate application. You will work with sample projects to develop and publish xAPI-enabled content for a specific outcome, and experience live data streams throughout the event. You will be guided through the process of building a data strategy, enabling your learning solutions to write xAPI statements to a Learning Record Store (LRS), and analyzing the data that is captured. 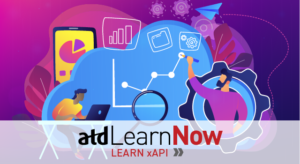 You will leave the event with your own sample project that reports real-time xAPI statements to an LRS, as well as access to self-paced courses and resources at Learn About the Experience API website. Explore the current state of xAPI, learn relevant terminology, and deconstruct case examples. Learn the proper methodology to design an xAPI-enabled project with data analysis as a primary driver. Develop an xAPI-enabled learning solution with rapid development tools and custom coding. Implement an LRS to capture statements in real time.